There are two hotels I wholeheartedly recommend in Palawan: The Acacia Tree Garden Hotel in Puerto Princesa and Sunz En Coron in Coron. Both get a double thumbs up! I also stayed in El Nido at a place called Le Solangane…and although everybody on staff was awesomely friendly, I can’t really give it a thumbs up due to the price vs. noise and basic features. But their restaurant is definitely worth checking out and has a stunning view. But enough rambling. Time to check out the Acacia and a bit about Puerto Princesa. Quiet environment, friendly staff, nice rooms, all at a decent price! If you are staying in Puerto Princesa, I promise you will enjoy the Acacia! It’s located very close to the airport (see map below), so you get picked up in their shuttle van and are chilling in your room in about 10 minutes. The rooms are super clean, have GREAT walk-in showers, GREAT beds — huge and comfortable, and the staff are friendly as could be. The manager there, Eric Garduce, is super helpful and can solve any problems you have. He can also set you up for other destinations on the island as he’s one of those guys with an endless Rolodex of names. And although not super cheap, it was reasonably priced at $65/night (this price includes all taxes and the Agoda booking fee). Here are some pics of the Acacia. Big bed, clean and spacious. Awesome! The very quiet hotel grounds come at a price: the Acacia (Pronounced Akachia) is a solid 10 minute trike ride away from the main part of the town. This is not a problem except trying to get into the town at night. So if you’re going out, you’ll get there more easily if you leave the hotel before 8ish while there are still trikes around. Although the front desk can call one for you any time day or night. Most people visit Puerto Princesa as a gateway to the Underground River (Pics, intel and video on the Underground River here). Beyond that, as far as I could see, the town of Puerto Princesa has very little going on. What little you’ll find runs along Rizal Avenue, the central downtown avenue. In the map below, to the left of Fernandez Street, you’ll find the live music bars and so on. To the right, you’ll see some pretty decent outdoor restaurants as well as some unmistakably seedy looking bars. Although I love seedy bars, on my one night out on the town I spent the entire time at the Tiki Restobar (see map). It’s a live music show bar (ie, they don’t just sing, but they do choreographed dance). It’s not cheap, but it had a great vibe and the design is beyond cool. Lots of neon and a cool Tiki theme. I loved it. If you need some caffeine to get you started before hitting the Tiki, Itoy’s Coffee House is this funky place that has decent and cheap coffee and a staff of locals who still have that “Wow, look, a foreigner!” charm about them. 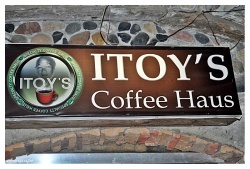 The food was NOT good there…but for the funky coffee vibe and some sluggish but free wifi, Itoy’s is worth checking out. I like the fact you can stay at Acacia Tree Garden Hotel at a very affordable price with blogging friendly people and environment. Man, the bed is huge! Hi Agness. Thanks for stopping by. Yeah, that bed was the best. I really had the most amazing sleep there. Plus the hotel just had this very chilled feeling to it. Just felt cool to be there. My First Jeepney Ride: 5 tips to get you started. Bayad Po!